Almost 70 years ago the world of music was profoundly changed forever when a cross-current of musical styles began to blend and create something never heard before. Musicians started melding traditionally African-American rhythm and blues tunes with jazz, boogie and even country which introduced a paradigm shift in music we now know as rock ‘n’ roll. This new popular musical genre would profoundly influence our nation’s cultural and social landscapes. Its impact continues to be felt both nationally and globally. American musical forms based on the blues, like jazz, R&B, rock and roll, and subsequently hip-hop and reggaeton have become the "lingua franca" of our modern world. Additionally, the way music is recorded, produced, distributed and learned is continuously changing. Digital technology, computers and the Internet have completely reinvented the broader field of music. Three generations of Americans have embraced this new music and its technological advancements, and its primacy and presence are felt everywhere—except for our public schools. 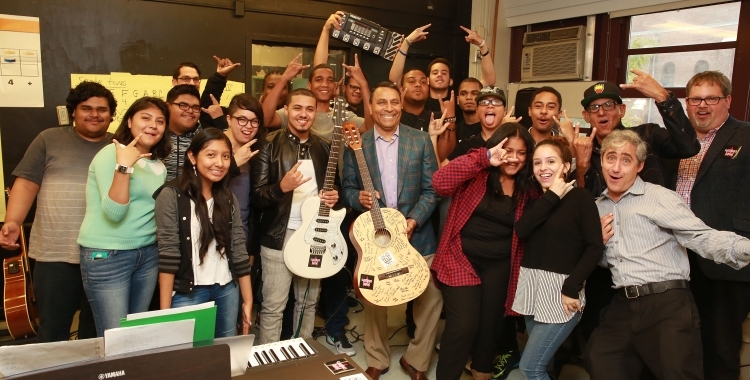 In 2001, I founded a nonprofit music education organization called Little Kids Rock that recognizes popular music as a cultural asset that is underutilized in our public education system. Using the music our kids already know and love allows them to see themselves reflected in the curriculum. And because that curriculum is based in popular culture, it can change, grow, and adapt to each student’s abilities and preferences – in school, outside of school, and beyond the student’s graduation. And now, thanks to a generous partnership with HARMAN, learning, creating, and recording music has never been easier. Through our new website, Jam Zone powered by HARMAN, anyone, anywhere can learn to play an instrument, produce and record music, and even write their own songs. The world of music does not stand still; nor should the world of music education. Research shows that making music positively impacts learning development and brain function and more so than simply listening to music. However, 1.3M elementary students in U.S. public schools do not receive music lessons, and only 17 percent of U.S. public schools require music courses as part of their curriculum. In December 2015, the United States Congress sought to ensure that all public school students receive a comprehensive, well-rounded education—which will now include music. For the first time in almost a decade, through the Every Student Succeeds Act, music education will be articulated as a core, stand-alone subject that should be a part of every child’s education, no matter their personal circumstance. We know that music changes kids and kids will change the world. Join me this month in celebrating Music in Our Schools. Visit www.littlekidsrock.org, or use the hashtag #MIOSM to learn more. Northwestern Auditory Neuroscience Laboratory, 2014.